Apart from sporting one of the cutest logos around, of a mortar and pestle-wielding rabbit, Moon Rabbit brings a big heart to the northside cafe scene. Open Monday to Friday, this social enterprise cafe gives disadvantaged young adults and those with learning difficulties the opportunity to get vocational training while serving a grateful community bang-up jaffles, slices and excellent coffee. 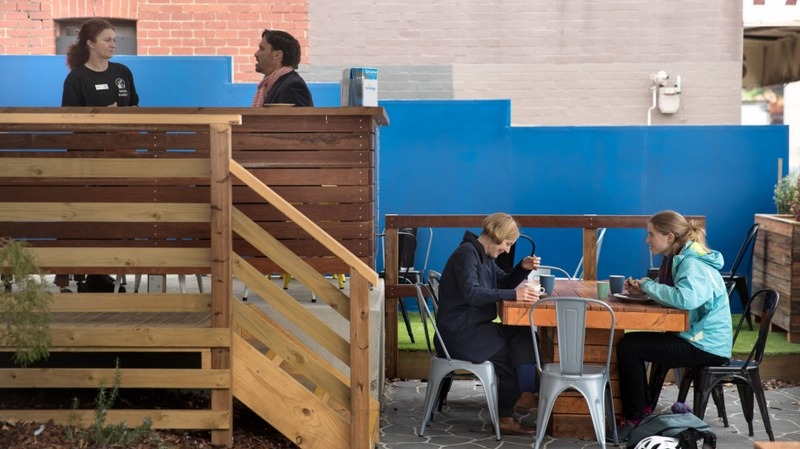 An initiative from community house The Bridge, which puts profits towards its programs such as Laneway Lunch feeding up to 60 people each Friday, it's got some of the keenest environmental credentials going, including banishing plastic and anything throw-away. Fronting onto High Street just north of Bell Street (yes, we've broached the hipster-proof fence but there's no need to be afraid), Moon Rabbit has taken over the front part of The Bridge HQ. A simple makeover has added a deck, Astroturf, crazy paving and planter boxes. The next few months will see the addition of gas heaters, transparent drop-down blinds and indoor seating. Let's forget the feel-goods for a minute and approach things from a position of complete self-interest. In short, the jaffles are excellent. Mostly veg (two of the seven feature meat), they include a gently herby and rather convincingly faux vegie bolognese (perhaps it's the parmesan that pulls the wool over this meat-lover's eyes). 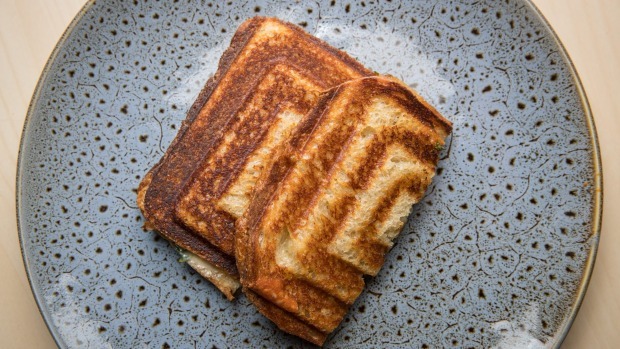 A combination of omelette, bitter greens, and a memorable roasted sesame sauce – like tahini, only milder and tangier – makes the O.M.Cheese an outright winner, the white sourdough from Northcote Bakehouse slathered to the very edges in butter, which is only right and proper. And did we mention they're a ridiculously well-priced $7? (Kids' jaffles are even more ridiculous at $3). 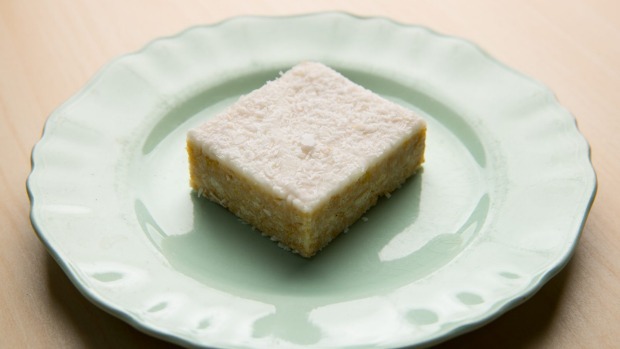 Sweets are made by the mother of The Bridge's executive officer, Chris Lombardo. Take a bow, Maureen. Your classic hedgehog, vanilla slice and florentines are the stuff of the Country Women's Association's fever dreams. Northside bean champions Padre strike again with their Daddy's Girl blend, which is fast becoming the default position for any cafe north of the Yarra. It's served strong and pitch-perfect with Jonesy's milk in a nanna-chic floral mug, one of hundreds donated by the local community. 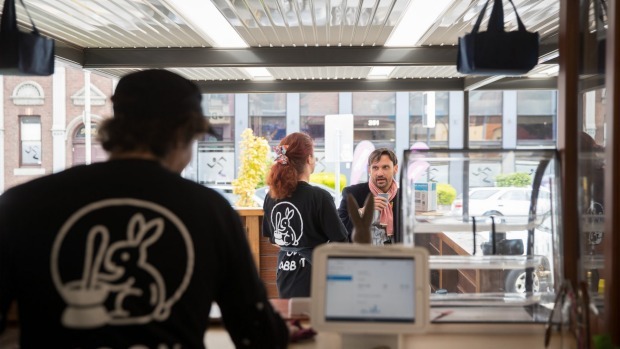 Moon Rabbit doesn't do takeaway cups – if you don't have your own they'll either sell you a reusable one (cute logo included) or let you take a mug to return later. Also: chai, and Capi soft drinks. No sir, it's a booze-free zone. Avo index Hop elsewhere for all your smashed avocado needs. Loving The warmth in the cockle region, a combination of Moon Rabbit's jaffles and ethos. Not getting Why there aren't more places like this. Overheard "Did you bring your own cup?"